Emotional and legal recovery are symbiotic and must be holistically treated as a system. 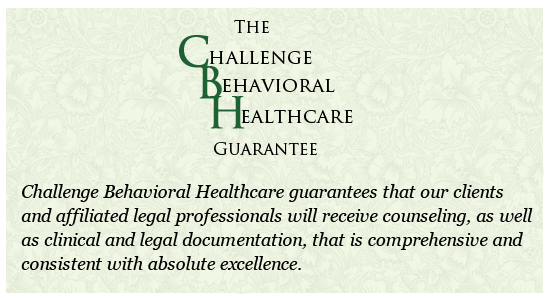 Challenge Behavioral Healthcare is one of the preferred providers by DuPage County Probation and Court Services, as well as many respected Attorneys who specialize in the field. If you have ever been convicted of a DUI, or work within the legal field, then you undoubtedly know how challenging the process of full recovery can be. Throughout our company's history, we have too often seen the frustrations from legal challenges preventing clients from obtaining the help they want or need. Our agency not only specializes in holistic and client-centered outpatient treatment, but we also provide clients with comprehensive documents that ensure an expedited and problem-free experience in the courts. Challenge Behavioral Healthcare is fully licensed by The Department of Human Services (DHS) and The Department of Alcohol and Substance Abuse (DASA). Further, our programs and facility are overseen by our Medical Director and our on-call licensed Psychologist which permits us to foster a safe and quality assured environment.